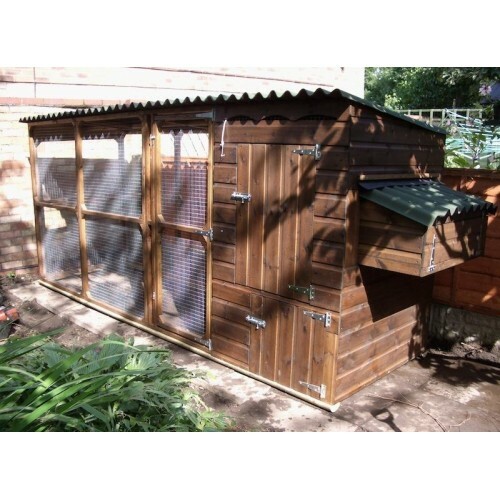 The roofed Chicken Run is 5 feet 8 inches long and is 42 inches deep. The Run roofing stops the run becoming a mud bath in the Winter and is of Onduline and matches the Hen House roofing. 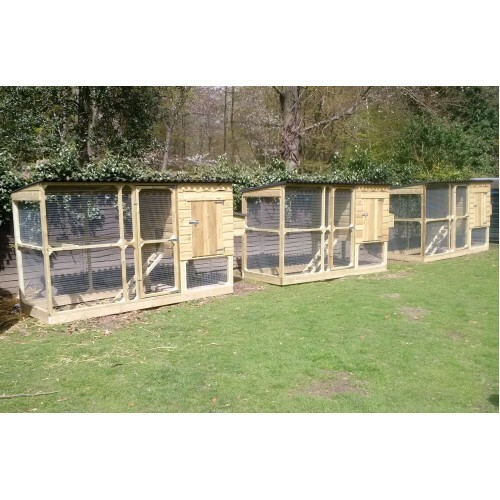 The Chicken House, Chicken Run and Nest Boxes all have Onduline roofing which is the preferred roofing for Poultry as it does not harbour parasitic red mite unlike felt plus it outlast normal felt by years and years, it also allows vital air circulation through the Housing. 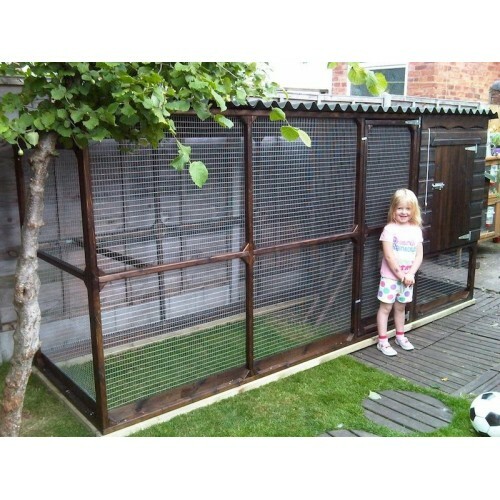 Additional Option - The underneath of the House, can be fully weather boarded to make a complete closed end to give shelter to the Chickens from driving wind and rain, we also create a small door under the main House door so feeders and drinkers can be placed underneath the Chicken House. 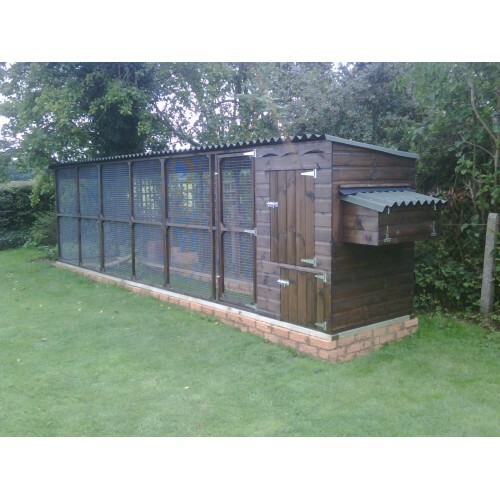 This wasn't our first hen house but, from start to finish, it was by far the best "hen-house buying" experience we have had. 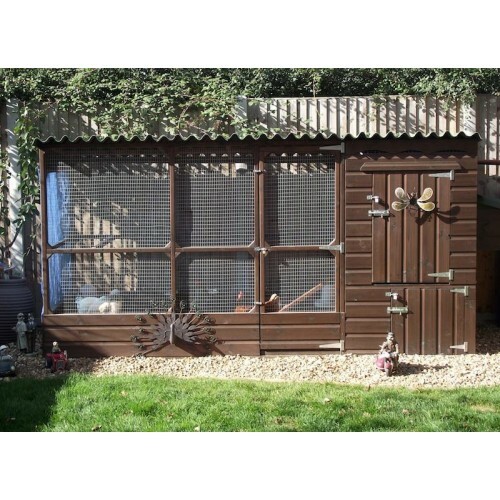 The hen house is well designed and made to a very high standard. Mark and Ian are very friendly and obviously took great pride in their product. We had requested some alterations and Mark was always patient with our requests which were all incorporated into the final build. ..
We just want to say just how great the James coop is, a work of art! This company is the best and we have no hesitation in recommending them. 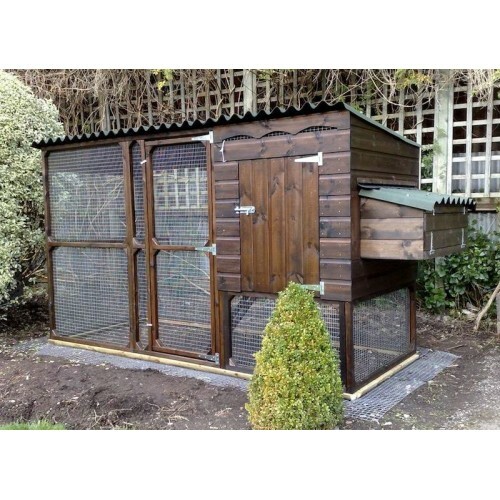 The best quality and design around.The girls shall be arriving at the end of Feb.So now all we have to do is plan the "COOP WARMING" party A big thank Mark and Ian for the advice,help, and super service. Making our long awaited dream a reality. Thank You S.. Thank you so much for our James Hen House It is truly beautiful,I trawled the net for weeks,and kept coming back to Woodenart,Am I pleased that I did,Mark and Ian take such pride in their work and it certainly shows in the finished product,nothing is to much trouble for them,even mending our fence.Wonderful customer service,thank you Mark for being so patient with me, answering all of my questions.. When you read all the reviews before you buy the expectations and anticipations are duly met. From the start it was clear this was going to be a quality product supported by Mark and Ian, quietly passionate about their product. We might have gone a bit OTT with the foundations for the new house but it was worth it to see the masterpiece in place. 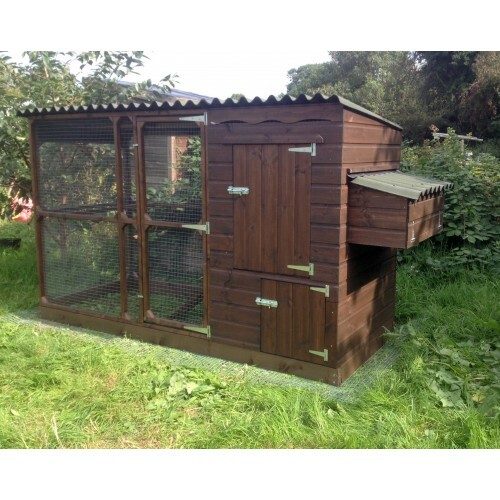 A great chicken house, made in the UK by a very..
Have been looking for a suitable home for chickens for ages. So glad i decided on a james - great quality, efficiently erected even on my not so level site! I would thoroughly recommend wooden art for all your poultry needs!.. The more I and the chickens see of our new 'James' henhouse and run the more I realize that it's a really well-designed and beautifully crafted structure, which we intend to enjoy for many years to come. 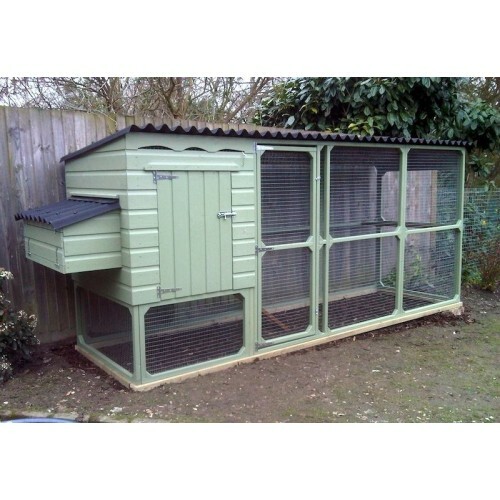 It definitely has a distinct edge over my existing three coops - all from different manufacturers, but all lacking something in design or build-quality. 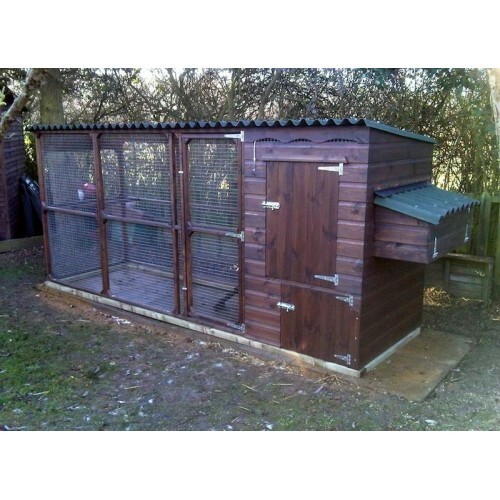 Many thanks Mark and Ian for your helpful, ..
Immensely pleased with my new hen house. Like others in reviews I researched for months and could not find any other hen house to beat these. 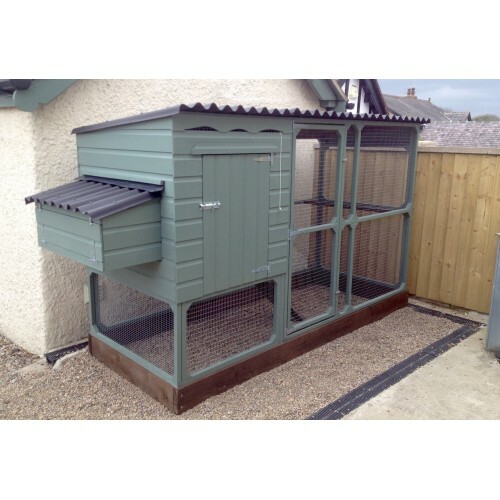 The design of these are based on Mark's own experience of keeping chickens, so everything has been thought out with brilliance and care, right down to using corrugated felt on the roofs to deprive red mite of hiding places. 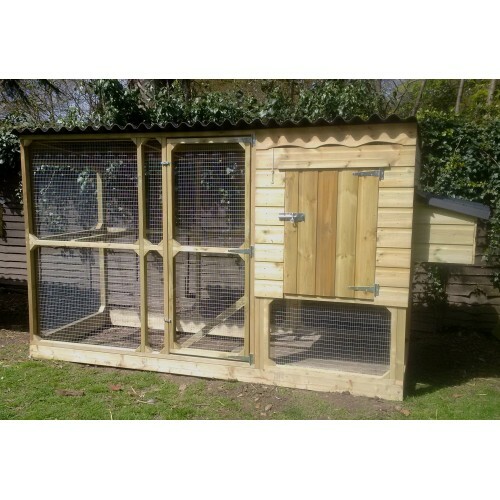 Reading the reviews I was exp..
Our hen house arrived today, what a fantastic product. We are so pleased with it and I can't stop looking out of the window to admire it. Mark and Ian arrived at the time they specified and put the house and run together so efficiently. They were really helpful and gave us lots of advice for settling the chickens in. As we are initially getting ex-battery hens they gave us a different ladder which..